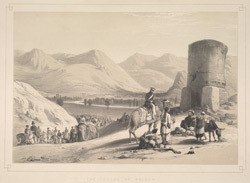 This is plate 16 from 'Sketches in Afghaunistan' by James Atkinson. Maidan is one of the five valleys around the source of the Bara river, which together comprise the Tirah region of the Pakistan-Afghanistan border. Bounded by mountains some 8000 feet tall, the oval-shaped valley us inhabited by the Afridi tribe. Atkinson vividly conveyed the beauty of the area: "[The valley] is semi-circular, and about a mile and a half wide, and four miles long, hemmed in by the most sterile hills, with a charming silver line of river flowing through its centre, and the trees, meadow, and plantations, always appearing bright and glowing." The road through, however, was "most rough and rugged, and intersected with deep ravines, where numerous Camels belonging to the Brigade in advance had perished, and many left, exhausted, to die." The round tower, or Burj, in the picture served as a watch house across the valley.